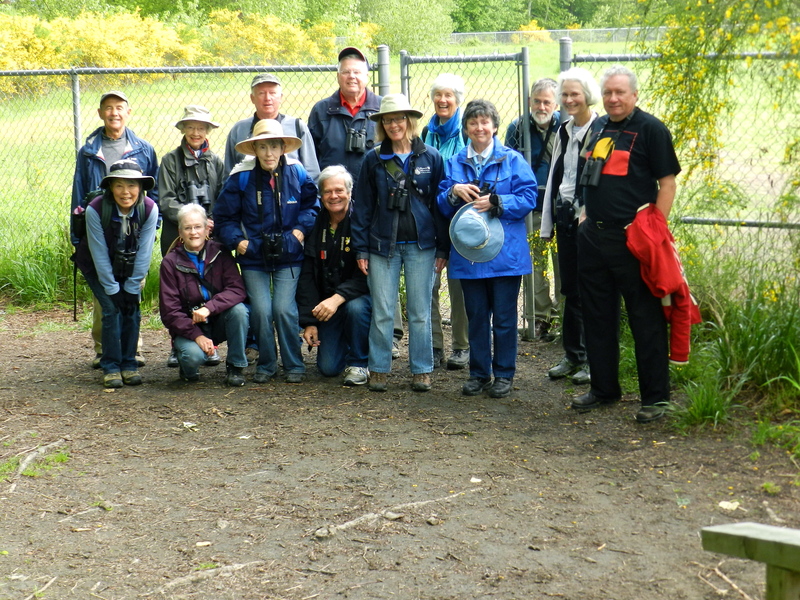 Fourteen DNCBers enjoyed another beautiful Wednesday morning in Delta on an outing to several Ladner parks, including Ladner Harbour, Brigantine and South Arm Marsh Parks. We were: Ken & Anne, Marion and Roger (our 3 Photogs), PB Lorna, Mike, Kirsten, returnee Johnny Mac, Kay, Donna, Eleanor, Bryan & Janet and me. 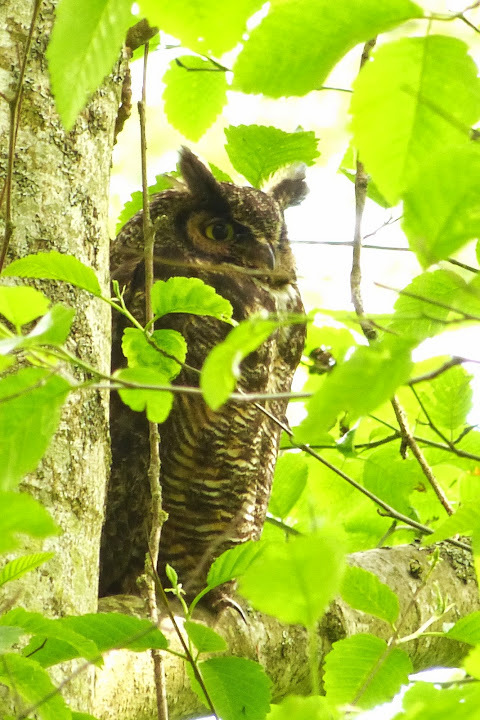 Hi-lites included: Great Horned and Barred Owls, Swainson’s Thrush, Cedar Waxwings, nesting Cooper’s Hawks and lots of Warblers. Check out photos, including of several beautiful flowers and plants seen, on our Picasa site. Six of us left Petra’s around 7:30 a.m. and met the rest of the group around 8:00 a.m. in the Ladner Harbour Park parking lot. 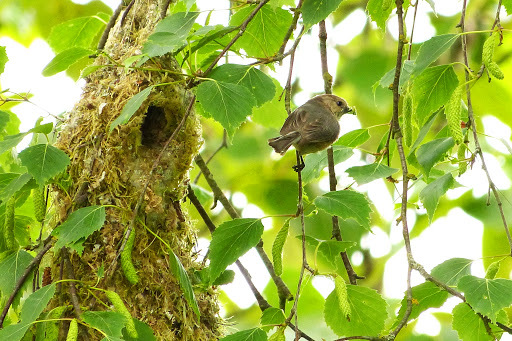 Marion had already found one of several Bushtit nests where parents were busy bringing food which was very entertaining. Lots of Warblers heard and some got good views of Wilson’s (most common), Yellow-rumped, Yellow and Orange-crowned, and later, near the water, Common Yellowthroats. 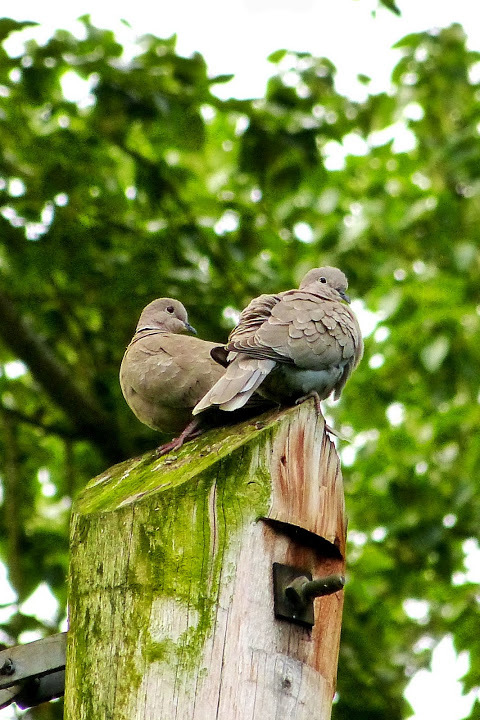 Eurasian Collared-doves were very common as we walked the well-groomed path through the woods, and its vine-covered trees. Lots of dog walkers using this park too. 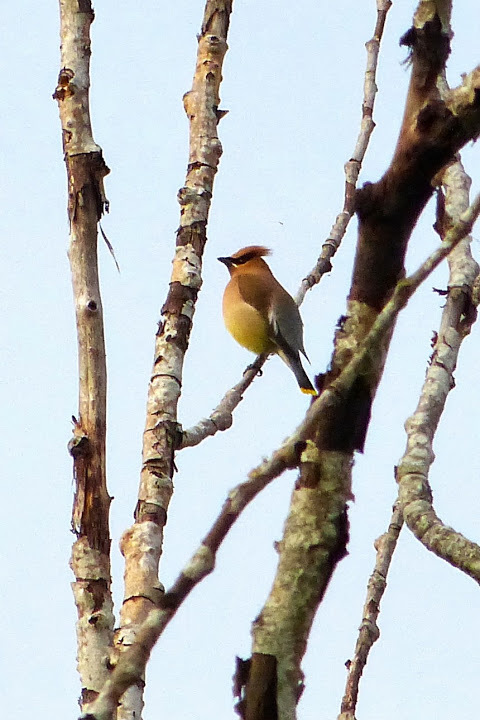 A Brown-headed Cowbird and two Cedar Waxwings caught our fancy. 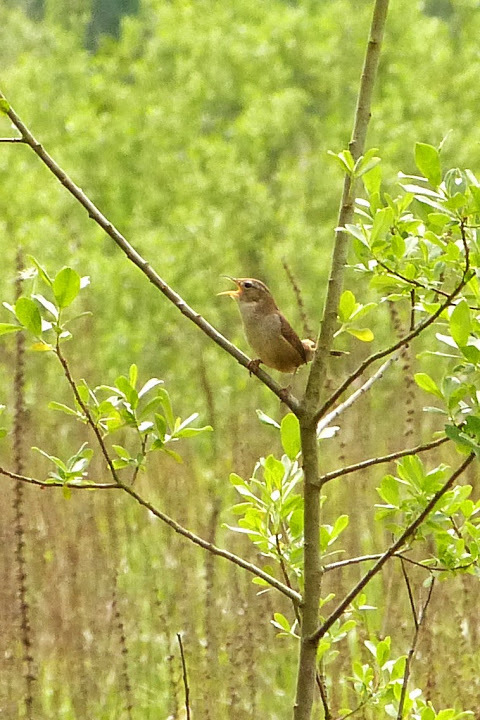 Many Marsh Wrens in the reeds on the shore, gathering nesting material from the bullrushes. Black-headed Grosbeaks were recognizable as they sang like Robins with singing lessons. Ken took the obligatory Group Photo at the Lookout at the end of the path, craftily including caged Bryan. This Lookout continues to befuddle me as to why Delta (I assume Delta Corp built it) would build it facing a condo development across the river. There are so many other beautiful vista spots close by they could have chosen. On the walk back to the parking lot, some saw a Barred Owl and a Flycatcher of some sort. We had our Smoko at a decent time, around 10:00 a.m. with reliable Lorna’s PB sandwich and Kay’s tasteless Japanese biscuits. No one brought beer for the umpteenth consecutive week. We drove on to a couple of paths along the slough among the housing developments off Ferry Road (e.g. Brigantine Park). 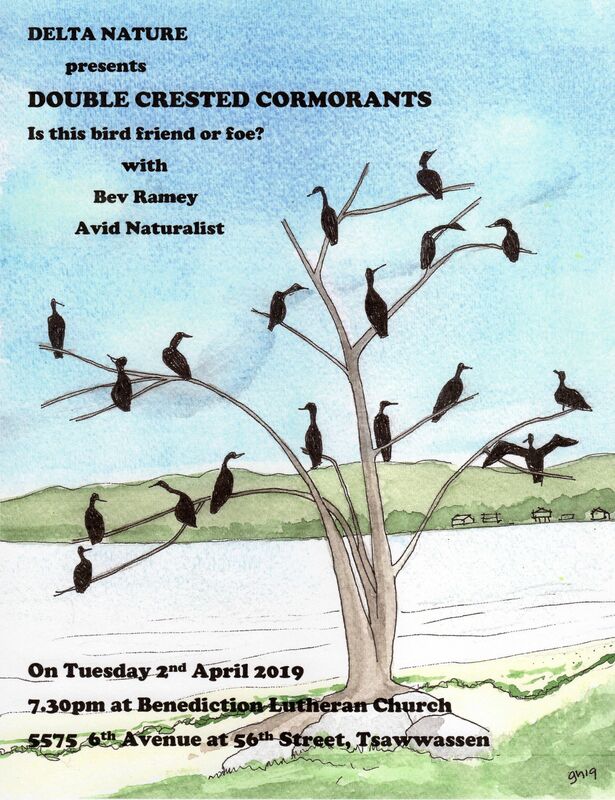 Northern Flickers, Downy Woodpeckers and Starlings were seen nesting in some of the many holes in the dead tree trunks. Not much in the slough except Mallards, a few Wood Ducks and an American Wigeon. Both Tree and Barn Swallows were hawking insects over the water. Roger was pleased to show everyone the Cove Links Golf Course where he gets whupped by certain other DNCBers regularly on Thursday mornings. 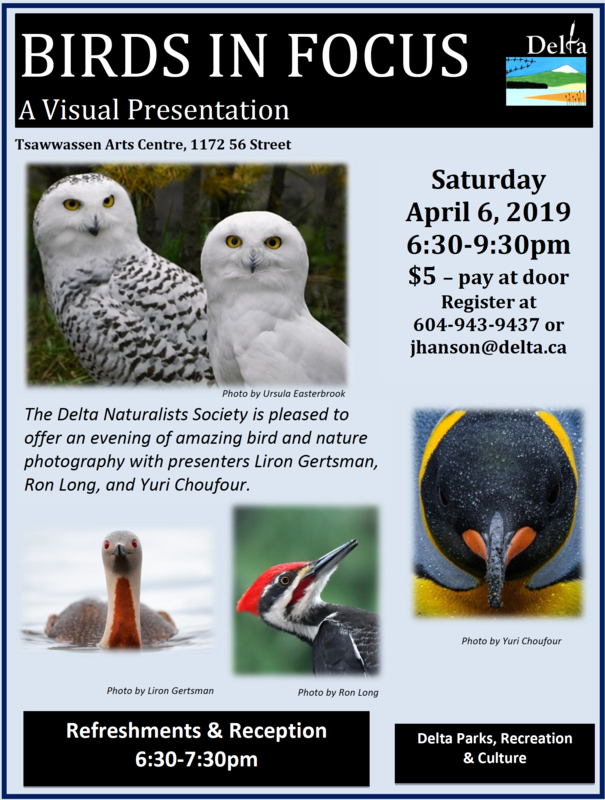 Swainson’s Thrushes and a Great Horned Owl, up-close-and-personal. We walked the paths to the Lookout at various speeds, causing us to split into a few groups. 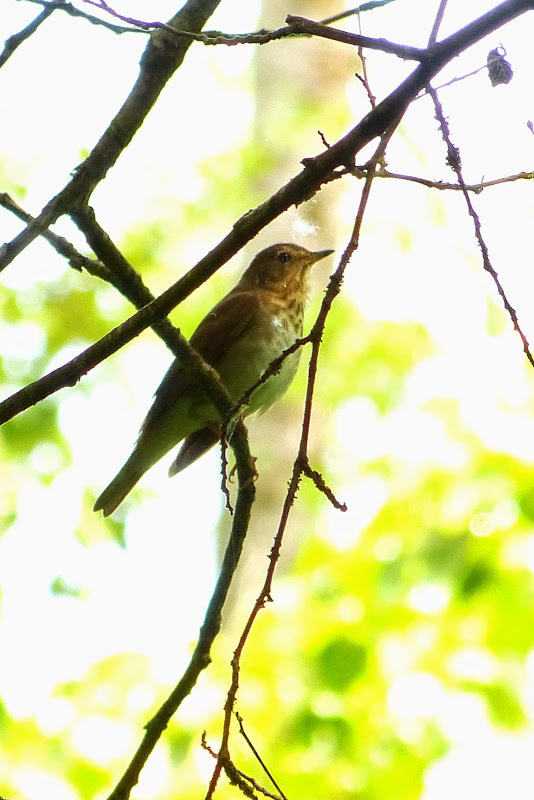 More Warblers singing but difficult to spot. 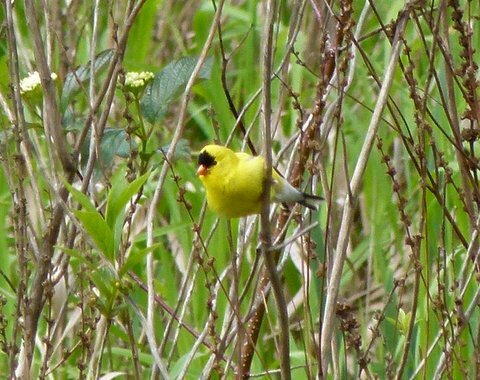 Brilliant American Goldfinches posed and continuously noisy Spotted Towhees annoyed our hearing senses. 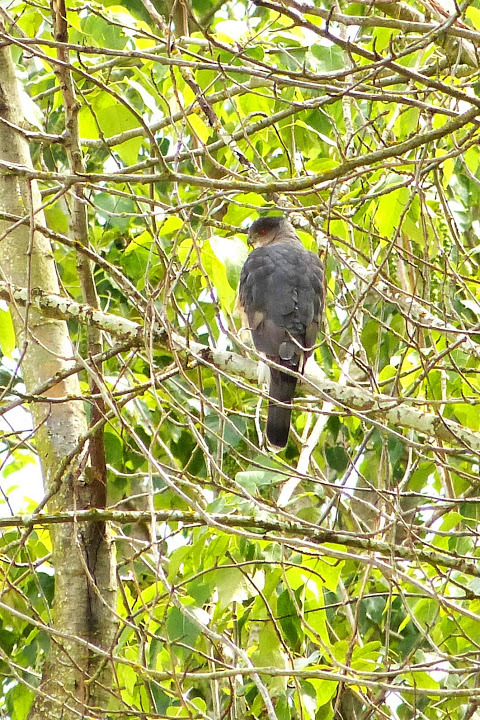 We re-grouped at the vehicles and, before heading home, decided to stop at the Cove Links Golf Course parking lot to check out the Cooper’s Hawk nest. Mom was sitting on the nest while Dad was posted in a nearby tree. This was a fitting end to another fun and successful DNCB outing. 4) June 12 – Pitt Lake. 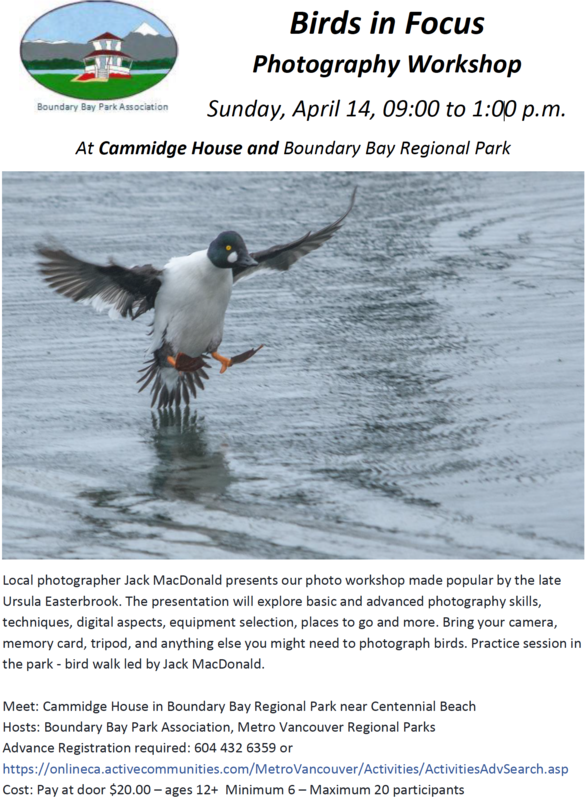 This entry was posted in *DNCB, Barred Owl, Cooper's Hawk, Great Horned Owl, Ladner Harbour Park, Ladner S.Arm Marsh. Bookmark the permalink.